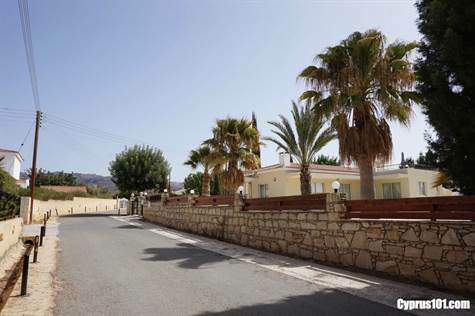 Peyia, Paphos – This delightful 3 bedroom detached bungalow is situated on an impressive 1340 sqm plot in a quiet residential cul-de-sac, a few minutes’ drive from Coral Bay. The accommodation features a quirky shaped living area with corner feature fireplace, dining area, fully fitted kitchen, master bedroom with en-suite shower room, two further bedrooms and a large family bathroom. Electric gates open to access a long driveway and double size garage with remote controlled shutter door to the rear. From the driveway, there is direct access to the kitchen. Off the living area is a spacious veranda overlooking the 11m x 5m swimming pool which has roman steps for easy access. The beautifully landscaped gardens are easy to maintain and include many varieties of shrubs and trees. To one side of the pool is a large pergola with BBQ table and steps lead up to a large roof terrace with a purpose built BBQ unit with storage cupboards and sink. This is a wonderful place to enjoy outdoor dining and the stunning views of the Mediterranean. The property is perfect as a permanent and/or holiday home and has full title deeds.